Your wait for BlackBerry iOS users is over. BlackBerry is delighted to announce the release of its BlackBerry Messenger. 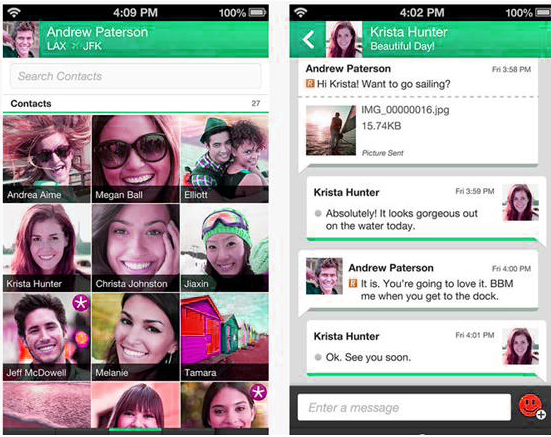 Now the users of BlackBerry, iPhone can enjoy the essence of BBM. How will BlackBerry messenger look? BlackBerry knows that it has to maintain a user-friendly application for iOS users. So they developed an iOS application, which can provide a fantastic user appearance. This application allows you to see your contacts in a grid format. Just click on one of your friends and start chatting with them. Let’s see the outlook of this application. For using BBM on your iPhone, it should have iOS 6 or iOS 7 as the operating system. The sad news of iPad users is that, BBM is not compatible with tablets users right now. What Can I Do with BBM? With BBM, you can chat with your friends, send group messages, share files, share documents, send smiley’s, establish a group chats, create a BBM profile, broadcast messages and use it as a complete chatting application. How do I setup BBM? Once you download the iPhone application from the AppStore, you will have to complete the setup wizard. While you are setting up your account with BlackBerry, you will be prompt to create a BBID (BlackBerry Id). BBID is the BlackBerry Id. It is the email id, which you have used during the setup process. It is an ID which will allow you to access BBM on your iPhone. BlackBerry will store all the data using this BBID. Once you create your BBID, you will have to confirm your email id as well. How do I reset my BBID password? To reset your BBID password, you have to go through the following steps. Can I use same BBM pin in iPhone and BlackBerry? If you wish to use the same BBM pin in iPhone and BlackBerry, you will not be able to do so. Once you set up a BBM account in iPhone, your account will be logged off your BlackBerry phone. You may have to use 2 different BBM pins in both the phones. Can previous BBID contacts be transferred in new BBID? When you create a new BBID, you have to invite your friends to use BBM services. You will not be able to transfer your contacts to your new BBID. How do I add contacts in BBM? You can either add the contact by scanning the bar code of your friends or type in their BBM pin. Once you add them, you can start communicating with them. Once you login with your BBID, your contacts will be automatically backed up in BlackBerry’s server. If you wish to restore them, just type your BBID and your contacts will be restored from BlackBerry’s server to your iPhone. Can I Block someone on BBM? If you wish to block someone on BBM, you can. After blocking them, they will not be able to send any messages to you. The best part is that the user won’t know you have blocked him. How to unblock someone on BBM? If you decide to unblock a personality, then you can navigate to the context key and click on settings. Click on the blocked contacts field and tap edit to unblock a BBM user. How to create a group in BBM? button and fill in the required details. Once you do so, you will be the owner of the group. You can create a group of 30 members. Enjoy the benefits of the group chat. Does BBM read my contacts? BBM doesn’t scan any contacts of your phone and it doesn’t send any automatic invites. This helps to maintain your privacy. Get in the app store and download BBM for iPhone. You will be able to share, chat and socialize with your friends easily. Have great fun with BBM. Happy messaging!